The hot and humid North Carolina summer weather wears me out after a simple walk around my tiny garden or after a few hours working on the deck. The heat makes me feel less motivated and more time thinking about napping. This is the time of the year that slow cookers are made for. Make dinner while doing other, less heat producing, chores. While I’m writing this, I have 2 cooking away in the kitchen and it doesn’t heat the house up one bit. I’ll be posting more summer slow cooker recipes as the season wears on, so don’t put that slow cooker away! I’ve been watching and waiting for my tomatoes to get ruby red and my eggplant to grow large enough to pick. It will be a while before mine are ready, so I got some early tomatoes from the farmers market, and gave I in and bought an early eggplant at Trader Joe’s. Don’t judge me – I really wanted to make the Eggplant Tapenade from Vegan Slow Cooking for Two. It’s great straight from the slow cooker, but perfect for summer when you eat it cold from the fridge on crackers. 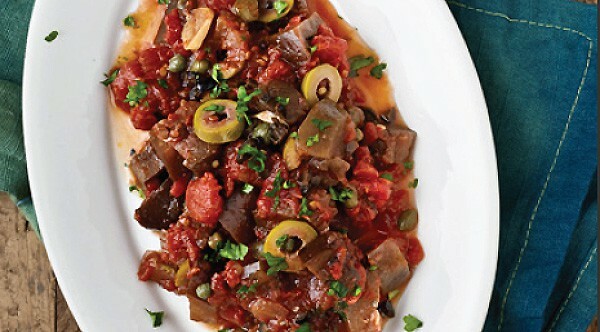 The slow cooker is eggplant’s best friend. This warm veggie spread will prove it to you, plus that can be crunchy or smooth - it’s all up to you. Add everything above balsamic vinegar to the slow cooker and cook on low 7 to 9 hours. Before serving add the vinegar, basil, salt and pepper. You can either leave it chunky for bruschetta or purée it in a food processor until you have tiny pieces for crackers or crostini. I love this veggie combo, but if you aren’t in love with olives, just leave them out. I’ve done it and it really comes out yummy! Delicious! Thank you for joining the VVLP! Just took this out of the slow cooker. It smells amazing. I can’t wait to dig in. My sneak preview taste =two thumbs up. This is a great recipe for fresh eggplant. Salty delicious! We ended up making a version of this in the pressure cooker (my slow cooker is packed away in preparation for a move). The eggplant completely broke down to make a delicious sauce for pasta. Thanks for the inspiration! So if you do not have a slow cooker how long would I cook this in a Cast Iron Dutch Oven in the oven?? I can’t give you an exact time since I’ve never cooked it that way, but I’d say once the eggplant was tender and cooked through you would be good to go. You also might want to either cook it covered or add extra liquid. In fact I would go ahead and add a 1/4 water to begin with since you will use a pan larger than 2 quarts. If there’s too much liquid at the end, just uncover and cook until it’s the way you’d like it to be. Oh yum! 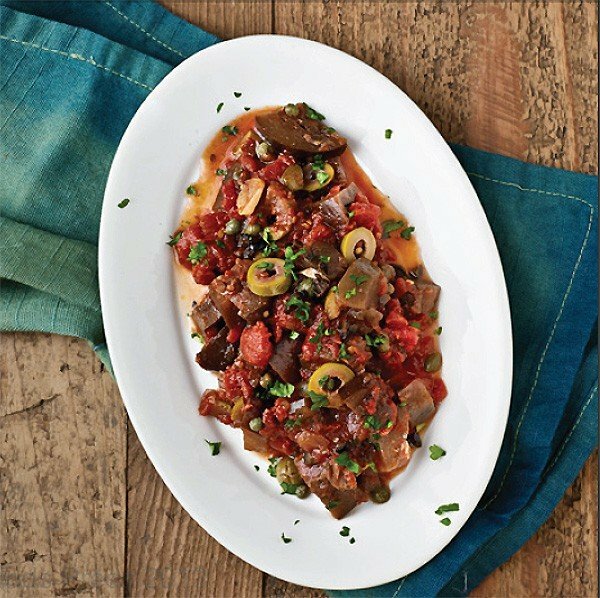 I love olive tapenade and can’t wait to try this eggplant one! I love the idea of using my slow cooker for a light meal when it’s too hot to cook! I don’t cook meat at all, so I’m not sure. I don’t, but you can if you’d prefer to. No need to salt and drain the chopped eggplant first??? I think they could work. Can i cook covered in the oven for shorter time? Do you think red wine vinegar could be subbed? THANK YOU! A friend “gifted” me 5 large eggplants:). I was intimidated but found this recipe. I used more like 4+ cups of eggplant, set my crockpot on HIGH because I feared it wouldn’t be done in time for dinner with friends. Result: 4 hrs+ mostly on HIGH worked!) Inserted hand blender at hour 5 & all blended in a wink ! GREAT flavors – spreadable on crackers or bread, delicious.